PrimaryCrypto is a cryptocurrencies broker. Primary Crypto offers the Web-based trading platform. 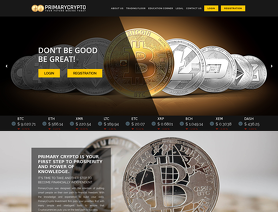 PrimaryCrypto.com offers bitcoins, ethereum, litecoin and other cryptocurrencies for your personal investment and trading options.